The Main Attraction: Flavor Packed Superfood Salads – What's for dinner, Doc? CSA's, Fiesta Friday, Healthy Eating, Recipes, Vegetarian, What's in the box? You can easily make a main dish salad using any fruits and greens that are fresh. When I shop for produce, I always have salad in mind. We eat some raw and some cooked vegetables every day for lunch and dinner. I buy the freshest super greens that I can find; arugula, kale, spinach, mesclun mix, mustard greens, or cabbage. The deeper the green, the better. These types of greens are an excellent source of folic acid, vitamin C, fiber, antioxidants and other essential nutrients. Iceberg lettuce on the other hand has very little nutritional value so pass it by and explore the green options. Most greens are on the dirty dozen list so buy organic whenever possible. Combine your greens with apples, pears, oranges, berries or any fruit that is in season. Roasting the apples and pears takes any salad over the top but you can use raw fruit as well. If your salad is the main attraction then add a nutritious source of protein with toasted nuts, legumes and/or small amounts of flavorful cheese like feta, blue or parmesan. You could add a small amount of cooked whole grains like barley or wheat berries. Skip the processed meats and go light on the cheese if you are watching your calories and saturated fats. Use a light hand when dressing these flavor packed salads. A light drizzle of olive oil or nut oils and a squeeze of lemon or orange juice is all that’s needed. Heavy mayo dressings are high in calories and will bury the delicate flavors of your fresh vegetables and fruit. There are endless possibilities when building a main dish salad. Preheat oven to 400 degrees F. Slice pears into 1/2 inch slices and arrange in a single layer on parchment paper over a baking sheet. Roast until soft and golden about 20 minutes. Lightly toast nuts on a separate baking sheet approximately 5 minutes. Watch closely because nuts will burn easily. When cool, roughly chop nuts and set aside. In a small bowl whisk together oil, juice of one lemon, onion, honey, 1/4 teaspoon of salt, and a dash of pepper until combined. 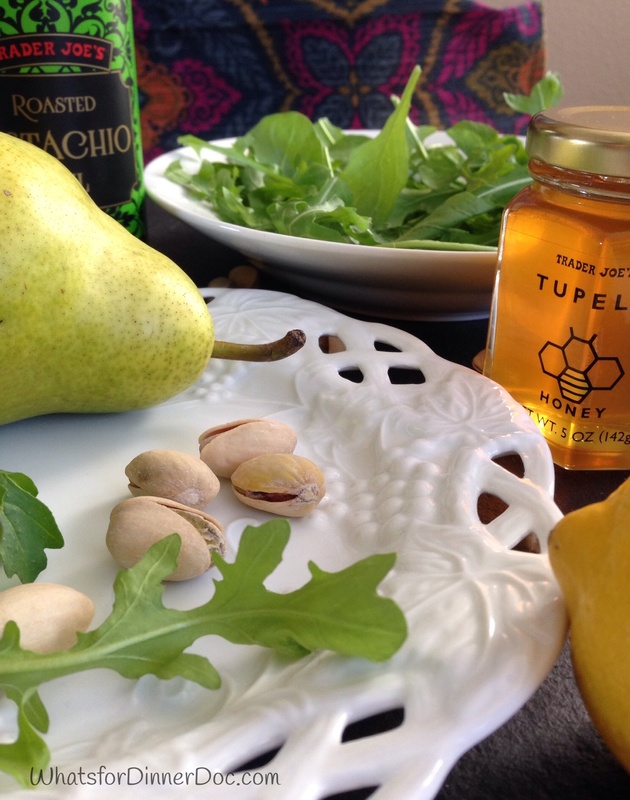 Arrange arugula on salad plates, top with pears, nuts and feta. Drizzle with salad dressing. I love a salad that has a mix of fruit and vegetables. 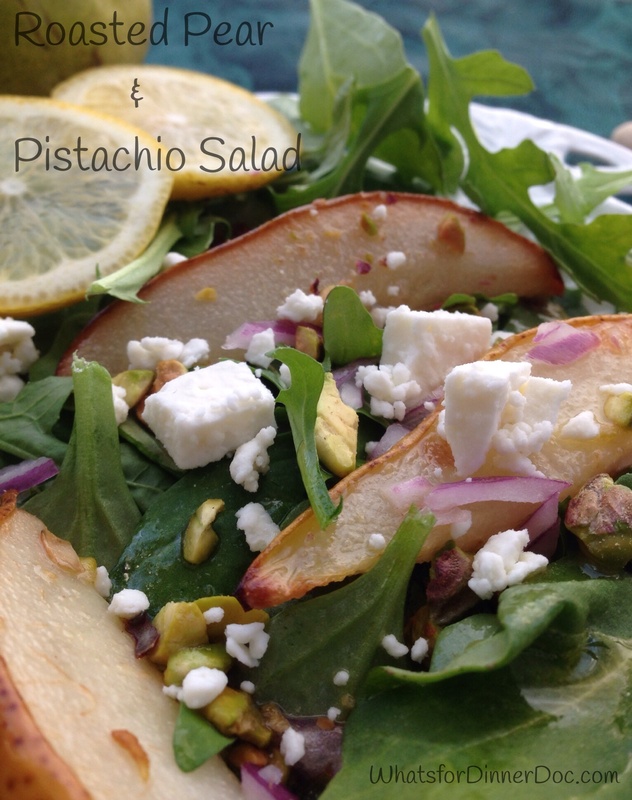 The pear and pistachio salad sounds delicious. Me too and roasted pears – very delicious. I found the fork in a little antique store in Napa. It’s a garden or herb market but I’m not sure you can plant peace in the ground but I’m sure we can sow peace. What’s a good substitute for Feta when you avoid dairy? Thanks Elaine. I love a mixed green salad. 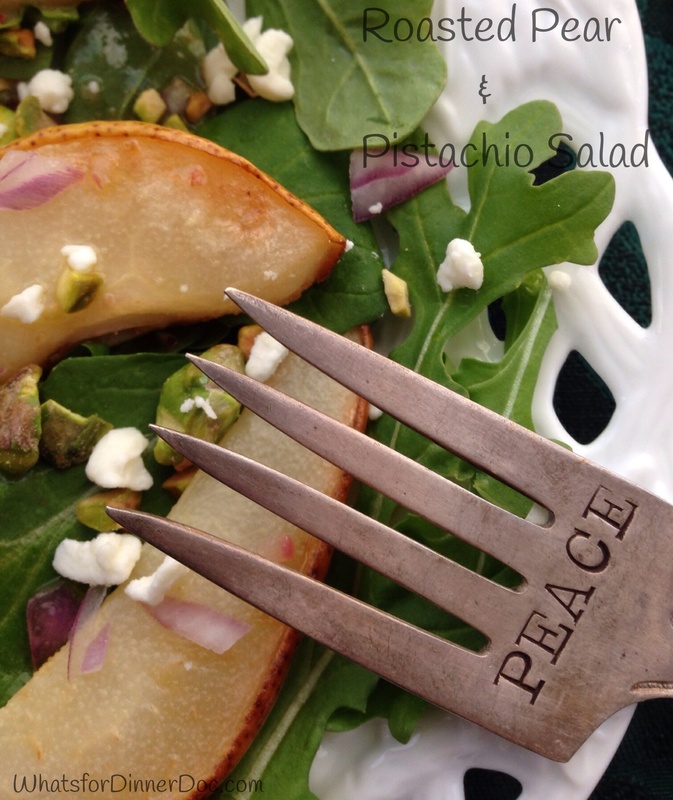 Your peace fork is awesome! Thanks Nancy. I’m a little behind in food blogging and reading. This looks like a tasty salad, I do love pears. I found it at Trader Joes in a gift pack with walnut and hazelnut oils. Pistachio oil has a toasted and delicious flavor but any oil would work. I love salads too. There are endless opportunities for delicious salads, warm or cold. I also like to use lemon and hney in my dressings. Also orange juice is perfect. Mmm this salad sounds amazing, the perfect thing to battle these winter blues! We have barely had any Winter in Nevada but I am missing the summer produce. I love salads. But dont have much ideas to make different types. This looks really good. Hi Sadia, anything can go into a salad. I’d always made a lot of salads but I always drowned them in salad dressing. When I changed my diet about 1.5 years ago I stopped using salad dressing altogether and started adding little diced bits of sweet Fuji apples or diced bits of orange to my salads and I found that I enjoyed my salads more than when I was using high-fat dressings. It was amazing to actually taste the salad as opposed to just tasting the dressing. I like your dressing recipe and hope to try it soon.